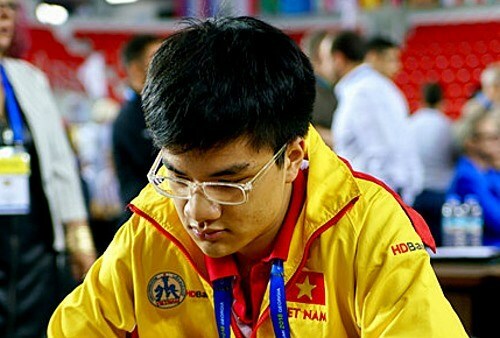 Hanoi (VNA) - Vietnam’s top chess players Nguyen Anh Khoi and Le Quang Liem are in the top 10 of the Sharjah Masters international chess tournament which is underway in the United Arab Emirates. International Master Nguyen Anh Khoi (Elo 2,484) managed a shock win against Grandmaster Ganguly Surya Shekhar of India (Elo 2,633) in the fourth round of the event on March 25 after 41 moves. The 17-year-old has so far earned 3.5 points after four matches to rank 10th out of 150 players, a mere 0.5 points lower than the current leading chess master, Inarkiev Ernesto of Russia (Elo 2,695). More importantly, Khoi has increased his Elo ranking by 11.6 points, which will stand him in good stead to get the Grandmaster title in the future. Meanwhile, Grandmaster Le Quang Liem (Elo 2,715) tied with Bonelli Eduardo of Venezuela (Elo 2,639) to rank third with 3.5 points.